I am studying SystemC as a course in my Master program. 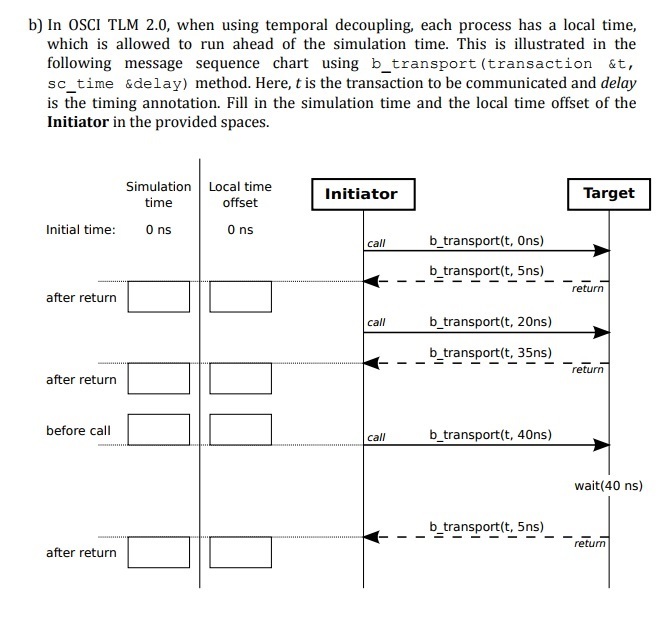 I have a qestion on Temporal Decoupling.. I have attached the question directly and please somebody can give a try and it would be of great help.. This is a discussion forum, not your homework/assignment discussion platform. It would be better if you could show what you came up with and discuss anything that you are not able to understand. I would recommend exploring the SystemC documentation directory(i.e. docs directory when you would have installed the SystemC library or when you downloaded the SystemC library sources.). My suggestion would be to implement this example and see what happens. In a process you will learn most of TLM-2.0 concepts.